I gave a second talk at Hand Eye Supply's Curiosity Club last September, and it finally feels like the right time to post it here. As I prepared for this talk, curiosity and creativity emerged as a useful way of approaching the questions raised by a climate in flux. In the months since, I've felt restless, wondering if there's other work I should be doing, even though I love working with clay. So I'm trying to experiment by staying curious about whether there might be a way to creatively use the tension between these distinct parts of my life rather than just assume the solution is to choose one over the other. I'm a big fan of Hand Eye Supply's Curiosity Club, and I had a lot of fun preparing and presenting this talk for them. You can find more presentations on a wonderfully eclectic range of topics on their YouTube channel. (and if you're feeling a bit impatient, start about watching about 3 min 30 seconds in, when she starts to describe how to make images that feel fresh and spontaneous by understanding how we actually see). This week marks two years since I set up a table to sell my work for the very first time at the First Thursday Street Gallery. And this year, this week includes another big threshold – I get the keys to a studio space of my very own. It's a little scary, but mostly very exciting, and I'm really looking forward to settling in and making it my own. It's an amazing spot and I feel very fortunate to have gotten it. 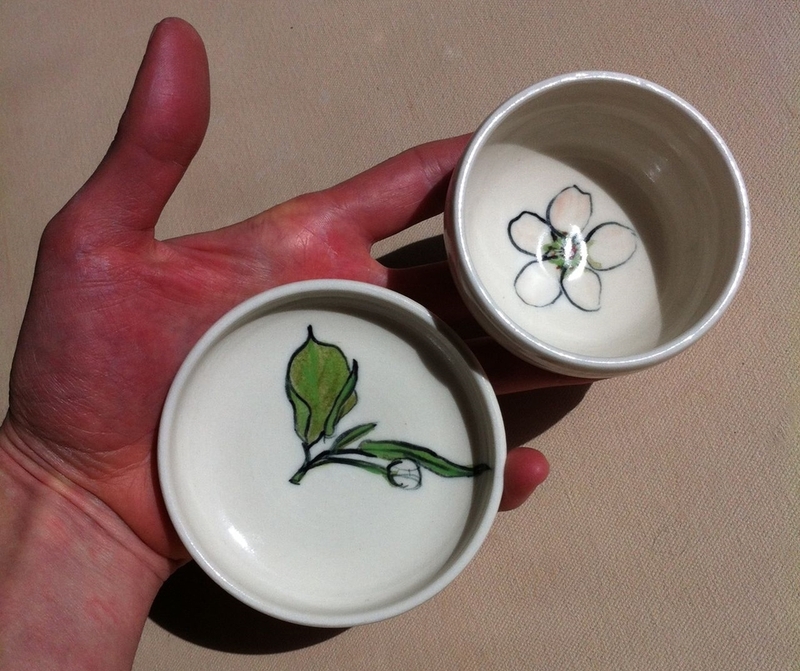 The risky part is that I decided to raise funds for a kiln and pottery wheel through Kickstarter. The way Kickstarter works is that you make a video and tell the story of the project you want to undertake, choose ways to reward people who want to back your project, then set a goal and a deadline, and launch it into the world, hoping that your friends and neighbors and interested strangers will join you. The fun comes in making the video and finding a concise and playful way to tell your story. The nerve-wracking part of this kind of crowdfunding is that your backers only get their rewards (and you only get your funding) if the crowd has pledged enough to meet the goal by the deadline. I'm currently eight days away from my deadline. The support I've gotten has been very encouraging, and I also still have a ways to go. There are a lot of risks in life, and in making a living as an artist, so this does feel like a good way to begin with this new studio. Being part of the Portland Urban Sketchers group has really helped me loosen up my drawing. Although I've often brought my watercolor set and a sketchbook while hiking, this week's trip to Jefferson Park Wilderness was the first time I've really used them, and the first time I've attempted anything more than a small sketch of a single flower. I of course still did sketch wildflowers (how could I resist?). But the big difference is that I also tried to capture my favorite mountain. It's summer, and with the lovely long days, it seems the last thing I want to do is sit down to write a proper blog post. But thanks to youtube, I can cheat a little by sharing a few videos that I've found especially inspiring. Enjoy! Right after seeing Tim's Vermeer, I placed a hold on David Hockney's Secret Knowledge at the library. It came in this week, and I stayed up too late three nights in a row reading it. It's a fascinating analysis showing how the Old Masters used converging lenses and mirrors to transform the three dimensional world into a two dimensional image in the same way a camera does today, with their brushstrokes capturing the image in place of the film or electronics we now use. The reason artists like Vermeer, van Eyck, Caravaggio, Velázquez, and numerous others were able to create photographic likenesses in their portraits so long ago was that they were actually doing their own kind of photography by letting the light focused by the lens or mirror graph the spatial relationships for the picture. Though the written hints of how they did this are rare, the evidence in the paintings is clear – the optical distortions of a lens or mirror that aren't present when our human pair of eyes look directly at a room or a face have been faithfully reproduced. It's a fascinating book, and David Hockney's writing is full of the delight of discovery. Reading Secret Knowledge also brought back a favorite memory from teaching a high school physics class in Indonesia. For one of the labs, we used convex lenses (they're thicker in the middle, and able to focus light) to show the physical basis for the ray diagrams in the textbook. It was fun to see the dim image of the wavering candle flame change position and magnification as we moved the lens towards or away from the actual candle, but the real magic happened when we held the lens up to the big windows along one wall of the classroom, and held an index card at the focal point on the opposite side – a glowing image of the distant hills appeared on the paper, upside down, but alive with the movement of clouds across the shimmering blue sky. You can get the same sort of image from a pinhole in a darkened room (camera obscura) or with a concave (magnifying) mirror, and it's certainly worth a try if you have a convex lens or a concave shaving mirror handy, or an interesting view out your window and good curtains. There happens to be a makeup/shaving mirror in the bathroom, so here's the image of the kitchen tile and cabinets, projected onto paper. Magic. The weather the last few days has been beautiful, and what better way to celebrate it than spend the morning outside sketching the first flush of cherry blossoms along the waterfront in downtown Portland? I joined Portland's Urban Sketchers and tried my hand at sketching cherry trees against the backdrop of the Steel Bridge. I'm still learning how to pick out the relevant details from a landscape scene for the sketch, but being around so many talented artists was incredibly inspiring. I finished up with some close up sketches of cherry blossoms, which was so much easier. Afterwards, a group of us went to see TIm's Vermeer (a very entertaining documentary about an inventor recreating a Vermeer painting), then tried out a neolucida that one of the sketchers had brought along. It felt a little like cheating to trace a sketch from life, but I think I'm going to have to get one. And if Vermeer wasn't above optical assistance, why should I be? Here's a really quick sketch I made using the device. This month marks a full year that I have been filling my days with clay. I began provisionally – giving myself permission to take six months away from the job search to do the one thing I still felt inspired to do. The studio where I'd been taking classes offered a monthly partnership with unlimited access at a very reasonable rate, and I was just getting to the point where I needed practice more than instruction, so in March 2013 I became a regular at the studio. And somehow, here I am, still at it.